An exterior quality fine texture emulsion paint based on an acrylic resin. Contains a fungicide to inhibit mould growth on the paint film. The formulation gives an attractive fine granular finish and allows a higher build. STIR THOROUGHLY BEFORE USE. Seal new or bare surfaces with a thinned coat of Weathershield Textured Masonry Paint (up to 1 part water to 5 parts paint). 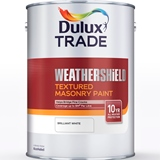 The normal finishing process is 2 full coats of Weathershield Textured Masonry Paint, but on previously painted surfaces in good condition, where similar colours are used, 1 coat may be sufficient. For best colour consistency, purchase sufficient tinted paint for each job including touch-in at one time from the same source.